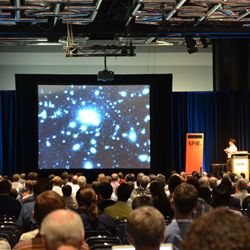 Plenary talks by institute directors, senior scientists, and other leading researchers along with a 115-company exhibition are among highlights planned for SPIE Astronomical Telescopes + Instrumentation in Edinburgh next month. The biennial event is the premier international gathering for researchers, developers, suppliers, and program managers in the field. Plenary talks by institute directors, senior scientists, and other leading researchers are among highlights; above, 2016 symposium chair Masanori Iye, NAOJ, presents at the 2014 event in Montréal. A new track in radio astronomy joins long-running tracks on ground-based and airborne telescopes and instrumentation, interferometry and imaging, detectors, adaptive optics, observatory operations, and other topics. SPIE Astronomical Telescopes + Instrumentation, unparalleled as the global gathering for the international community of researchers, suppliers, and program managers of large ground- and space-based telescopes, will run 26 June through 1 July at the Edinburgh, UK, International Conference Centre. More than 2,500 papers will be presented in 12 conferences, including a new track in radio astronomy joining long-running tracks on ground-based and airborne telescopes and instrumentation, interferometry and imaging, detectors, adaptive optics, observatory operations, and other topics. Andrew Connolly, University of Washington, on surveying the sky with the Large Synoptic Survey Telescope (LSST). An Astronomy Hack Day chaired by Sarah Kendrew of the European Space Agency will give participants an informal opportunity to code and present on software, engineering, or hardware hack projects developed with new or existing collaborators. More information is at http://goo.gl/forms/O5Imb7tVs2. Lectures on telescope inventor James Gregory and on the search for and recent discovery by LIGO (Laser Interferometer Gravitational-wave Observatory) of gravitational waves predicted by Albert Einstein will be open to the public as well as conference attendees. Fred Watson of the Australian Astronomical Observatory will speak on Gregory, and Martin Hendry of the University of Glasgow will speak on Einstein and gravitational waves. Dame Jocelyn Bell Burnell will speak at a Women in Optics luncheon on careers in astrophysics. Burnell opened a new branch in the field as a graduate student when she discovered pulsars, and is now a visiting professor at Oxford University, a Pro-Chancellor of Trinity College Dublin, and President of the Royal Society of Edinburgh. A panel on gender equity will promote effective ways to increase gender diversity in the adaptive optics community. The panel follows presentations at the SPIE 2014 Adaptive Optics and AO4ELT4 conferences, and is supported by the Australian National University, European Southern Observatory, INAF--Arcetri Astrophysical Observatory, and Laboratoire d’Astrophysique de Marseille. A free-admission two-day exhibition (28 and 29 June) will feature 115 companies showcasing their latest technologies and systems, including devices and components for large ground-based telescopes, ground instruments, astronomy information technologies, space telescopes and instruments, detectors, and specialized optics materials and systems. The BAFTA-winning film Moon, praised for its compelling storyline and scientific credentials, will be shown at the Cameo Picture House, followed by a short talk and informal discussion with staff from the Royal Observatory of Edinburgh. Symposium chairs are Colin Cunningham, UK Astronomy Technology Centre, and Masanori Iye, National Astronomical Observatory of Japan.